SEAS – The SEAS Electric Light Source Ontology. The SEAS Electric Light Source Ontology. 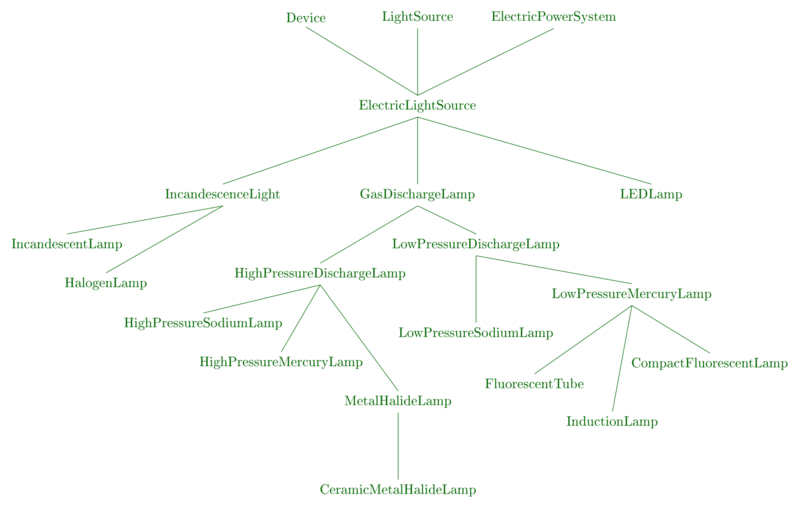 The SEAS Electric Light source ontology describes Electric light sources. The figure below shows an overview of the electric light source taxonomy. An electric light is a device that produces visible light by the flow of electric current. It is the most common form of artificial lighting and is essential to modern society, providing interior lighting for buildings and exterior light for evening and nighttime activities. In technical usage, a replaceable component that produces light from electricity is called a lamp. (source: Wikipedia). An LED lamp is a light-emitting diode (LED) product which is assembled into a lamp (or light bulb) for use in lighting fixtures. LED lamps have a lifespan and electrical efficiency which are several times greater than incandescent lamps, and are significantly more efficient than most fluorescent lamps, with some chips able to emit more than 300 lumens per watt (as claimed by Cree and some other LED manufacturers). The color rendering index of some light source. The color temperature of some light source. The luminous efficacy of some light source. The luminous energy of some light. The luminous flux of some light source. The luminous intensity of some light.